This protocol is for the performance of one-anastomosis gastric bypass (OAGB) on rat. The operator performs a long and tubular-stapled gastric pouch followed by hand-sewn anastomosis. For this model, the operator reproduces the same ratio between biliopancreatic and common limb in humans; therefore, the biliopancreatic limb measures 35 cm. Siebert, M. A., Chevallier, J. M., D'Aurelle de Paladines, D., Pottier, Y., Msika, S., Le Gall, M., Bado, A., Ribeiro-Parenti, L. One-anastomosis Gastric Bypass (OAGB) in Rats. J. Vis. Exp. (141), e58776, doi:10.3791/58776 (2018). The goal of this protocol is to set up a preclinical model of bariatric surgery and, more specifically, OAGB in obese rats. Based on this preclinical model, longitudinal studies can be carried out to provide an improved understanding of the mechanisms underlying the outcomes seen after bariatric surgery in humans. For this purpose, rats are operated on through a laparotomy under general anesthesia with isoflurane. First, the surgeon creates a long and tubular gastric pouch: after greater curve and hiatal dissection, the nonglandular stomach is stapled and removed. Then, the remaining stomach is also stapled in order to create a gastric tube and exclude the antrum of the stomach. After that, the surgeon performs a single end-to-side gastrojejunostomy 35 cm from the duodenojejunal angle. This limb length has been chosen in order to reproduce the same ratio between the biliopancreatic limb (BPL) and common limb (CL) length as in human bariatric surgery. The operation ends by aponeurotic and cutaneous closure. The early postoperative management consists of subcutaneous hydration, an intramuscular prophylactic antibiotic injection, a parietal injection of xylocaine, the administration of painkillers, and a progressive reintroduction of diet. Morbid obesity is a major health issue in the western world, with increasing prevalence1. Bariatric surgery remains the only long-term effective therapy for morbid obesity2, with clear benefits on obesity-related comorbidities3. Roux-en-Y gastric bypass (RYGB) remains the gold standard as it is one of the oldest procedures and one of the most-performed worldwide with the longest follow-up4. OAGB is a more recent procedure first described in 2001 by Rutledge5. It has been described as an effective alternative to RYGB6 and has some advantages. Early data indicates a similar efficacy to RYGB with respect to weight-loss and the resolution of obesity-related comorbidities6,7. Furthermore, the risks of stenosis or leakage of the jejunojejunal anastomosis in RYGB are avoided, and the risk of an internal hernia may be lower than with RYGB8. The physiological mechanisms underlying weight-loss after bariatric surgery remain controversial and can be difficult to study in humans9. Animal models are useful to understand how bariatric surgeries may impact glucose metabolism, neuroendocrine modifications, or satiety mechanisms. Comparative data between procedures are lacking and long-term effects of these surgeries need to be better understood10. It is not possible to fully standardize pre- and postoperative clinical care, and satisfactory follow-up can be difficult to achieve: some studies report loss-to-follow-up rates as high as 30% for the first year11. The concept of gastric bypass is a combination of a restrictive procedure, due to the creation of a gastric pouch, and a moderate degree of malabsorption, resulting from the exclusion of the duodenum and the proximal jejunum from the gastrointestinal transit. Currently, limb length in bariatric surgery is still a matter of debate12,13. Available data show a high variability of procedures and no consensus has yet been reached on the optimal limb length for OAGB14,15. Nonetheless, many authors have reported a 200 cm BPL length as the standard for OAGB16,17,18. The mean length of the small bowel is about 700 cm19. Several rodent models of RYGB have been developed worldwide20, with great variations in terms of pouch size, limb length, and the preservation of the vagal nerve. But very few authors reported a model of experimental OAGB; for this reason, theresearch team developed a model of OAGB in collaboration with bariatric surgeons. The rationale behind the development of the model was to mimic gastric bypass practiced in humans. The model incorporates the construction of a gastric pouch with the exclusion of the antrum and the body of the stomach. For it, the surgeon makes an ablation of the nonglandular stomach using a stapling device. Compared to a previous protocol20, the team decided to add a per-operative prophylactic antibiotic treatment in order to diminish the morbidity linked to gastrointestinal anastomosis, as is routine in human surgery21. The rat limb length used in this model was chosen to reproduce the ratio between the BPL and the CL in humans. Preliminary measurements have shown the total small bowel length in rats to be between 90 and 120 cm22. Consequently, the length of the BPL chosen for OAGB was 35 cm. Furthermore, this model is practicable without making any vascular ligation, avoiding gastric pouch ischemia. All animal use conformed to the European Community guidelines and was approved by the local ethics committee (Comité d'éthique en expérimentation animale N° 121) and the Ministry of Higher Education and Research (Ref #02285.03). Use male Wistar rats weighing 260 - 320 g, started on a high-fat diet (HFD) at 7 weeks of age. Induce a diet-induced obesity, with at least 12 preoperative weeks of the HFD. Give the rats free access to water and the HFD. NOTE: The HFD consists of a purified laboratory hypercaloric rodent diet containing 45% fat (see Table of Materials). Ensure that the rats are obese at the time of surgery, with a weight between 600 - 800 g.
Autoclave all surgical instruments before surgery. Lay out all the surgical instruments needed for the procedure (see Table of Materials). Perform the anastomosis under magnifying glasses, using conventional and microsurgical instruments. Ensure that the rats are positioned on the warming plate at a temperature of 37 °C and under a heat lamp. Position the isothermal electric board as needed. Anesthetize the rat with an inhalation of 3% vol isoflurane in air for the induction of the anesthesia in the rodent box. Transfer the rat to the warming plate and maintain the anesthesia with the facemask at the same flow rate of 3%. Ensure that the anesthetization is complete by pinching the tail of the animal. Shave the anterior fur, corresponding to the laparotomy's incision zone, a ~3 cm-wide zone from the xiphoid to the animal pelvis, using an electric razor. Shave a 3 cm-wide zone on the back of the animal, centered on the neck of the animal. This step facilitates monopolar power conduction. Spray an alcohol-based disinfectant solution over the operation site. Apply alcohol-based local antiseptic on the shaved skin. Open the abdomen with a midline cutaneous incision from the xiphoid process of about 3 cm in length with a scalpel. Open the fascia and the peritoneum along the linea alba with a monopolar scalpel. Ensure that the peritoneal cavity is opened on the entire length of the cutaneous incision. Expose the peritoneal cavity with a self-retractor. Dissect the greater gastric curve from the junction between the glandular and nonglandular stomach to the left side of the abdominal esophagus with surgical scissors. 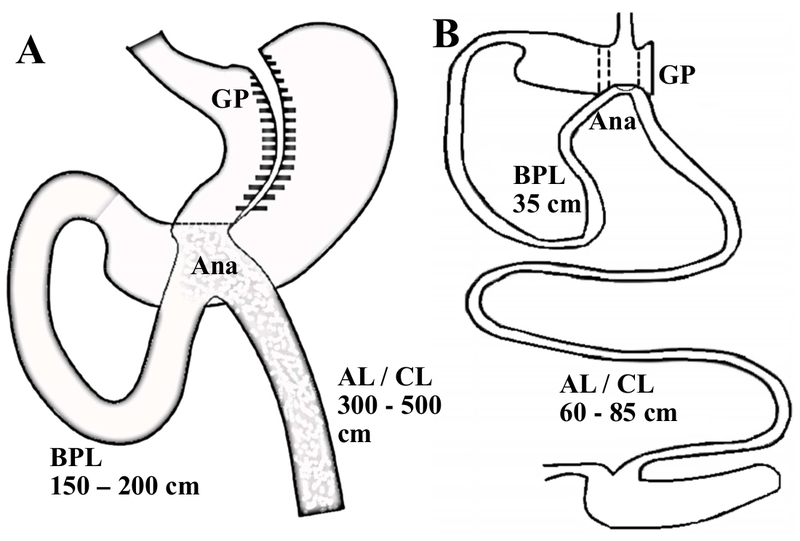 Progressively coagulate the gastrosplenic vessels with the monopolar scalpel, in order to fully liberate the great gastric curve to the His angle. Then expose the hiatal area by sectioning of thin ligaments. Dissect the right side of the abdominal esophagus, preserving the left gastric artery and vagal nerve, using a manual dissector. Apply a 35 mm staple gun (see Table of Materials) at the junction between the glandular and nonglandular stomach to the left side of the gastroesophageal junction. Ensure that the nonglandular stomach is on the right side of the stapler. Fire the gun and then remove the resected nonglandular stomach. Apply a second stapler using a thoraco-abdominal (TA) device (3 - 3.5 mm) (see Table of Materials), parallel to the first stapling, on the right side of the gastroesophageal junction to exclude the antrum and a part of the body of the stomach. Ensure that the result of the two staple lines is a gastric pouch about 0.5 cm wide. Locate the duodenojejunal angle. The proximal jejunum is the small bowel portion located under the medial portion of the colon; it is the only nonmobile part of the small bowel in the rat. With a 5 cm-long tape, manually measure 35 cm from the duodenojejunal angle. Then perform a punctiform enterotomy on the antimesenteric side of the jejunum. Perform a punctiform gastrotomy with the monopolar scalpel on the greater curve side of the gastric pouch, precisely between the two previous staple lines. If the gastric pouch is not totally empty, perform gentle manual pressure on the gastric pouch to empty it. Perform an end-to-side gastrojejunal anastomosis with nontraumatic forceps and a small needle-holder. Start the suture with two extremity stitches of 7-0 isotactic polypropylene (see Table of Materials), suturing the two extremities of the gastrotomy with the extremities of the enterotomy. Then, with the same threads used for the two extremity stitches, perform two running sutures on each side of the anastomosis. If needed, return the anastomosis to facilitate the maneuver. Ensure the quality of the anastomosis by placing close stitches, at least seven or eight on each side of the anastomosis. Take 1 mm-wide serosa in every stitch. Avoid taking any mucosa in the stitch in order to gently bury the enteric and gastric mucosa inside the suture. NOTE: The result of this is a terminolateral gastrojejunal anastomosis with a biliopancreatic limb on the left and an alimentary (AL)/CL on the right. Ensure that the anastomosis is permeable with gentle pressure on the gastric pouch. Rinse the peritoneal cavity with 0.9% NaCl solution and manually replace the abdominal organs into their physiological positions. Close the abdominal wall with one running suture of braided polyester suture 2-0 (see Table of Materials) with a classical needle-holder. Close the skin with one running suture of polyglactin 910 4-0 (see Table of Materials). Perform two parietal injections of lidocaine 1% on each side of the laparotomy. Administer a total dose of 1 mL/kg of lidocaine 1% into the rectus abdominal muscle aponeurosis. Perform an intramuscular injection of 20,000 units/kg penicillin G.
Perform a subcutaneous injection of 10 mL of isotonic polyionic solution potassium (2 g of KCl/L, 4 g of NaCl/L, and 50 g of glucose/L). In this injection, it is possible to mix with suitable analgesics such as buprenorphine (0.1mg/kg) and meloxicam (2mg/kg). Place the rats in individual cages warmed up by a lamp until they are fully awake. Frequently inspect the animals in order to administer postoperative treatment with suitable analgesia and hydration (isotonic polyionic solution). Inject suitable analgesic, buprenorphine (0.1 mg/kg) and meloxicam (2 mg/kg), subcutaneously from the immediate postoperative period till day 4, every 12 h.
Keep the rats with free access to water during day 1. On day 2/3, give them free access to a liquid diet. On day 4, give them ad libitum access to a normal diet. This protocol is reproducible and mimics OAGB as practiced on humans. The safety of this protocol is supported with published data23,24 with a low mortality rate between 12% and 25%. Different surgeons in the research team with a similar mortality rate have practiced this protocol. Nonetheless, learning rodent surgery is complex, and the use of magnifying glasses is mandatory. Indeed, the critical step of the construction of a microscopic anastomosis requires a learning period from around 15 to 20 operations to reach an optimal dexterity. A surgical defect can lead to an anastomotic leakage of a gastric obstruction, which is the main death cause in our experience. Another key to success is the postoperative nutrition; indeed, an early postoperative solid nutrition can be dangerous. This protocol also provides a precise postoperative nutrition protocol, which has been demonstrated to be safe. The concept of this surgery on humans and on rats is illustrated in Figure 1. A result of the operation after sacrifice is provided in Figure 2. 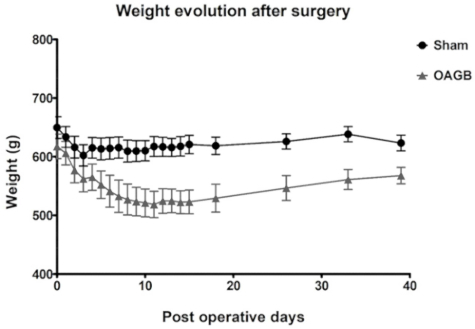 Results obtained on weight loss after operation on obese rats were quite similar to those observed in humans, with a body weight loss of about 20%, stable after the operation. The results are detailed in Figure 3. 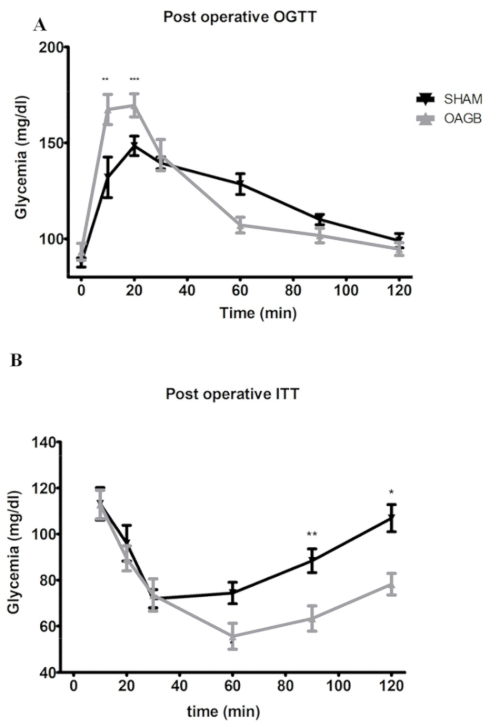 Better insulin sensitivity and glucose tolerance were observed as soon as 2 weeks after the surgery, as assayed by an oral glucose test (OGTT) and an insulin tolerance test (ITT). These results are detailed in Figure 4. HFD-induced obesity has been described to promote insulin resistance and glucose intolerance in Wistar rats25; comparable data have been gathered in our unit (unpublished). Wistar rats are not a model of type 2 diabetes. Figure 1: Illustration of OAGB on humans and on this rat model. (A) Scheme of an OAGB in humans; the gastric pouch is long and tubular and the BPL measures between 150 and 200 cm. (B) Rat model of an OAGB. The ratio of the BPL and the AL/CL reproduce the one practiced for human surgery; the BPL measures 35 cm. Abbreviations: GP = gastric pouch; Ana = anastomosis; AL = alimentary limb; CL = common limb. Please click here to view a larger version of this figure. Figure 2: Illustration of OAGB on rats after sacrifice. Abbreviations: GP = gastric pouch; Ana = anastomosis; AL = alimentary limb; CL = common limb; Oes = Esophagus; Duo = duodenum Please click here to view a larger version of this figure. 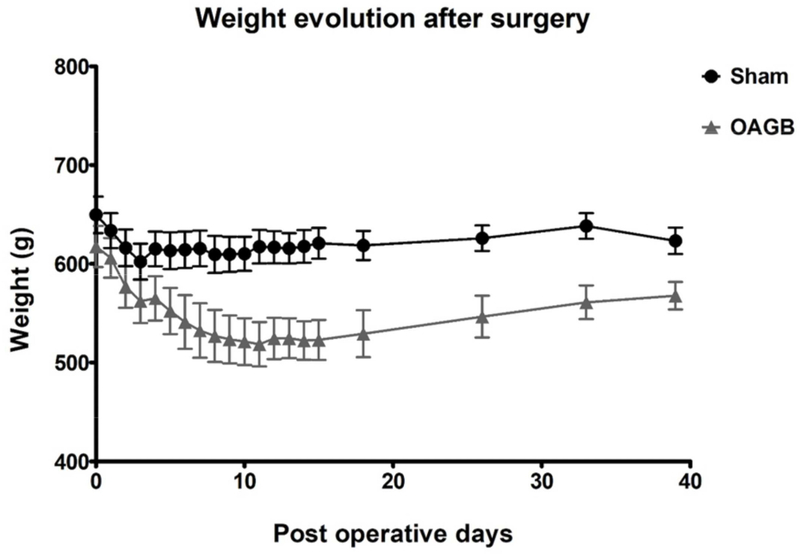 Figure 3: Postoperative weight evolution (median ± SD) after OAGB and sham surgery. The sham surgery consisted of a laparotomy and a pinch on the great gastric curve with non-traumatic forceps. Please click here to view a larger version of this figure. Figure 4: Glucose metabolism after OAGB and sham surgery; post-operative OGTT and ITT. (A) Post-operative OGTT. OAGB and sham rats were made to fast before being subjected to an oral glucose tolerance test (OGTT: 1 g/kg of body weight). (B) Post-operative ITT: an injection of 1 U insulin/kg of body weight. Rats were made to fast 4 h before receiving the insulin injection. Blood was harvested in the tail vein at t = 0 and at 10, 20, 30, 60, and 120 min after the insulin or glucose administration. Glucose was measured using a blood glucose meter. Glycemia was expressed in mg/dL ± standard deviation. Abbreviations:OGTT = oral glucose tolerance test; ITT = insulin tolerance test; BW = body weight. * p < 0.05, ** p < 0.01, *** p < 0.001; after two-way ANOVA statistical test. The sham surgery consisted of a laparotomy with a nontraumatic pinch of the great gastric curve using non-traumatic forceps. All data are presented as mean ± SD. Please click here to view a larger version of this figure. This protocol has the advantage of mimicking OAGB practiced routinely in humans. 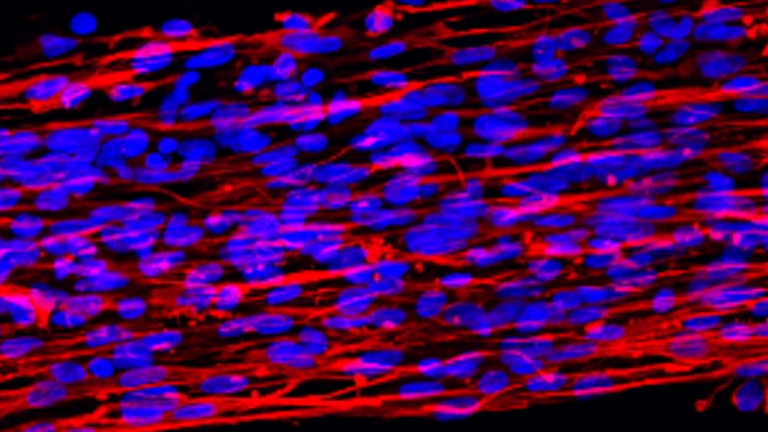 Its safety and reproducibility in rats have been demonstrated in clinical and metabolic results. The anastomosis in this protocol poses a technical difficulty and is the main critical step. For this, it is necessary to use specific microsurgical tools, such as a microsurgery needle-holder or magnifying glasses. In order to realize a hermetic anastomosis without any stenosis, it is necessary to perform at least seven to eight close sutures on each side of the anastomosis and to avoid taking any mucosa in any stitch in order to bury it inside the suture. The effective management of pain and animal welfare, as well as progressive postoperative nutrition as described previously, is mandatory. However, this protocol has some limitations. First, the surgical approach is a laparotomy instead of a laparoscopy, due to the small size of the animals. There is no division on the right side of the gastric pouch. This choice has been made for technical reasons. Nonetheless, no repermeabilization of the gastric pouch has been observed after 15 postoperative weeks. Furthermore, mimicking the restrictive effects on rats is very difficult while maintaining ad libitum access to food. Animals may increase the frequency of oral intake in order to counterbalance the restrictive effect of the gastric pouch22,24. Additionally, there is no gastric resection in human surgery, whereas the rat's nonglandular stomach is known to be significantly expandable if not resected. No protocol of OAGB in rodents mimicking the human surgery closely has ever been published by other teams. This protocol might offer a good balance between surgical feasibility, safety, and clinical relevance. This method may also be used in the future to highlight physiological changes observed after RYGB and OAGB in humans, such as the theoretical increased risk of malignancy and the higher malabsorptive effect of OAGB, compared to RYGB. The authors would like to thank Jean Pierre Marmuse for his constant help and support; Eglantine Voitellier, Jean-Baptiste Cavin, and Houneyda El Jindi for setting up the models and the illustrations; Anne-Charlotte Jarry and Andreia Goncalves for their help with the videos; Sara J. Zaat for editing the text in English. Matthieu A. Siebert and Lara Ribeiro-Parenti were recipients of sponsorships from the Fondation pour la recherché médicale (FRM) and the Association française de chirurgie (AFC). Ogden, C. L., et al. Prevalence of overweight and obesity in the United States, 1999-2004. Journal of American Medical Association. 295, 1549-1555 (2006). Buchwald, H. Consensus Conference Panel. Consensus conference statement bariatric surgery for morbid obesity: health implications for patients, health professionals, and third-party payers. Surgery for Obesity and Related Disease. 1, 371-381 (2005). Mingrone, G., et al. Bariatric-metabolic surgery versus conventional medical treatment in obese patients with type 2 diabetes: 5 year follow-up of an open-label, single-centre, randomised controlled trial. Lancet. 386, 964-973 (2015). Nguyen, N. T., Varela, J. E. Bariatric surgery for obesity and metabolic disorders: state of the art. Nature Reviews. Gastroenterology & Hepatology. 14, 160-169 (2017). Rutledge, R. The mini-gastric bypass: experience with the first 1,274 cases. Obesity Surgery. 11, 276-280 (2001). Lee, W. J., et al. Laparoscopic Roux-en-Y vs. mini-gastric bypass for the treatment of morbid obesity: a 10-year experience. Obesity Surgery. 22, 1827-1834 (2012). Victorzon, M. Single-anastomosis gastric bypass: better, faster, and safer? Scandinavia Journal of Surgery. 104, 48-53 (2015). Magouliotis, D. E., Tasiopoulou, V. S., Tzovaras, G. One anastomosis gastric bypass versus Roux-en-Y gastric bypass for morbid obesity: a meta-analysis. Clinical Obesity. 8, 159-169 (2018). Seyfried, F., le Roux, C. W., Bueter, M. Lessons learned from gastric bypass operations in rats. Obesity Facts. 4 Suppl 1, 3-12 (2011). Wang, F. G., Yu, Z. P., Yan, W. M., Yan, M., Song, M. M. Comparison of safety and effectiveness between laparoscopic mini-gastric bypass and laparoscopic sleeve gastrectomy: A meta-analysis and systematic review. Medicine (Baltimore). 96, e8924 (2017). Hong, J., Park, S., Menzo, E. L., Rosenthal, R. Midterm outcomes of laparoscopic sleeve gastrectomy as a stand-alone procedure in super-obese patients. Surgery for Obesity and Related Disease. 14, (3), 297-303 (2017). Abellan, I., et al. The influence of the percentage of the common limb in weight loss and nutritional alterations after laparoscopic gastric bypass. Surgery for Obesity Related Disease. 10, 829-833 (2014). Nora, M., Morais, T., Almeida, R., Guimarães, M., Monteiro, M. P. Should Roux-en-Y gastric bypass biliopancreatic limb length be tailored to achieve improved diabetes outcomes? Medicine (Baltimore). 96, e8859 (2017). Madan, A. K., Harper, J. L., Tichansky, D. S. Techniques of laparoscopic gastric bypass: on-line survey of American Society for Bariatric Surgery practicing surgeons. Surgery for Obesity and Related Disease. 4, 166-173 (2008). Himpens, J. M., Vilallonga, R., Cadière, G. B., Leman, G. Metabolic consequences of the incorporation of a Roux limb in an omega loop (mini) gastric bypass: evaluation by a glucose tolerance test at mid-term follow-up. Surgical Endoscopy. 30, 2935-2945 (2016). Parmar, C. D., et al. Mini Gastric Bypass: first report of 125 consecutive cases from United Kingdom. Clinical Obesity. 6, 61-67 (2016). Chevallier, J. M., et al. One thousand single anastomosis (omega loop) gastric bypasses to treat morbid obesity in a 7-year period: outcomes show few complications and good efficacy. Obesity Surgery. 25, 951-958 (2015). Kular, K. S., Manchanda, N., Rutledge, R. A 6-year experience with 1,054 mini-gastric bypasses-first study from Indian subcontinent. Obesity Surgery. 24, 1430-1435 (2014). Tacchino, R. M. Bowel length: measurement, predictors, and impact on bariatric and metabolic surgery. Surgery for Obesity Related Disease. 11, 328-334 (2015). 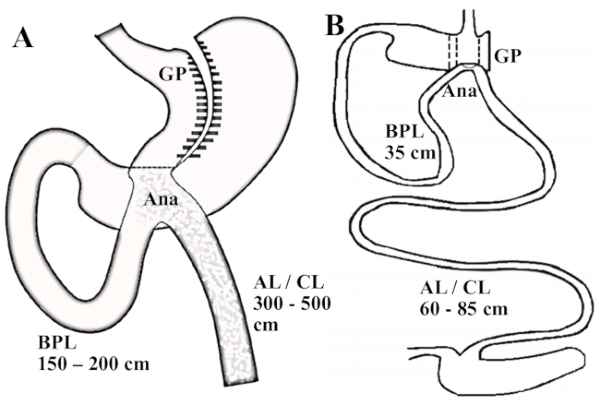 Bruinsma, B. G., Uygun, K., Yarmush, M. L., Saeidi, N. Surgical models of Roux-en-Y gastric bypass surgery and sleeve gastrectomy in rats and mice. Nature Protocols. 10, 495-507 (2015). Jeppsson, B., Mangell, P., Thorlacius, H. Use of probiotics as prophylaxis for postoperative infections. Nutrients. 3, 604-612 (2011). Cavin, J. B., et al. Differences in Alimentary Glucose Absorption and Intestinal Disposal of Blood Glucose After Roux-en-Y Gastric Bypass vs Sleeve Gastrectomy. Gastroenterology. 150, 454-464 (2016). Bruzzi, M., et al. 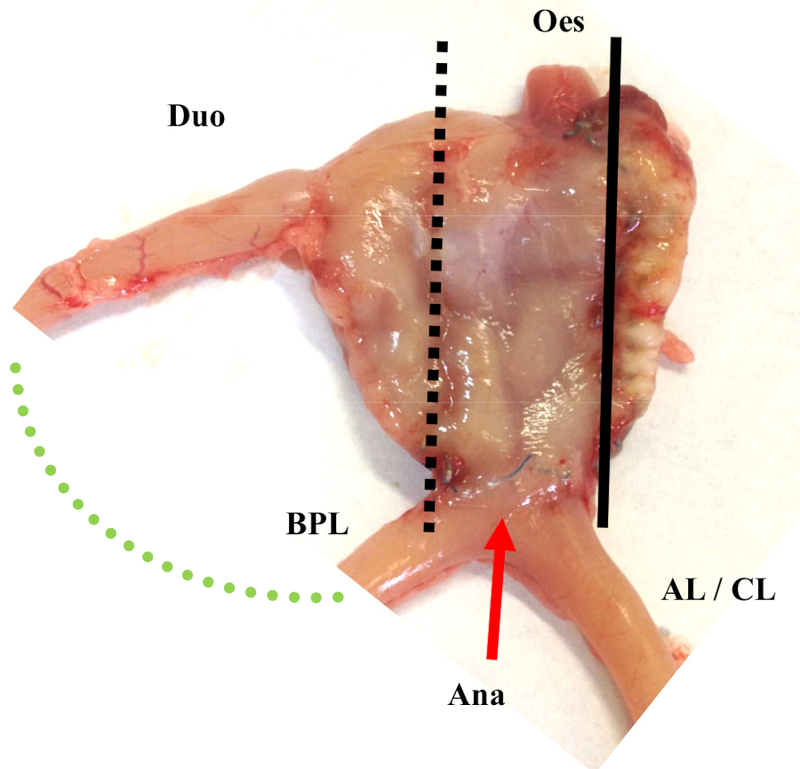 Long-Term Evaluation of Biliary Reflux After Experimental One-Anastomosis Gastric Bypass in Rats. Obesity Surgery. 27, 1119-1122 (2017). Cavin, J. B., et al. Malabsorption and intestinal adaptation after one anastomosis gastric bypass compared with Roux-en-Y gastric bypass in rats. American Journal of Physiology-Gastrointestinal and Liver Physiology. 311, G492-G500 (2016). Jacob, P. S., et al. Isocaloric intake of a high-fat diet promotes insulin resistance and inflammation in Wistar rats. Cell Biochemistry and Function. 31, 244-253 (2013).